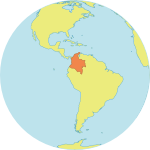 Viviana lives in Meta, a department in mid-eastern Colombia that has seen repeated attacks by paramilitary groups. Between 1985 and late 2013, over 2 million people under age 26 were displaced by the country’s unrest, according to the Victims' Care and Comprehensive Reparation Unit. The conflict has left young people with few reliable prospects for the future. The constant threat of violence – including sexual violence and forced recruitment into armed forces – has disrupted much of daily life. Public services, including health services, have been interrupted, and education and employment opportunities are limited. Like many young people, Viviana did not have access to sexual and reproductive health services or information. After her family’s move, she quit school and started working. “I was 15 years old when I moved in with my boyfriend. I became pregnant two months later,” she said. Still, Viviana fared better than most. When she was 18, her father encouraged her to join a local group for displaced youth. Through their activities, she was inspired to become a community organizer. In the city of Villavicencio, Viviana helped organize the Department Youth Roundtable, a group of 5,000 young people from 29 municipalities, to advocate on behalf of underserved youth. The group recently devised Meta’s first-ever Public Policy for Youth, which promises to improve the lives of conflict-affected young people. The Youth Roundtable engaged in numerous consultations with its members – who include youth from rural and urban areas, members of indigenous communities, displaced young people and other marginalized groups – to identify needs and propose solutions. The roundtable also worked closely with UNFPA. Since 2008, UNFPA has supported the group with training in public policy, human rights, and sexual and reproductive health. UNFPA also provided the group with technical advice and funding for key advocacy activities, and facilitated direct dialogue between the young leaders and government institutions. The result of these efforts, the Public Policy for Youth, was recently adopted by Meta’s Departmental Youth Council. The policy guarantees the rights of young people and calls for their development, education and access to livelihoods. It also creates the Youth Management Programme, a fund supporting scholarships and better opportunities for vulnerable young people. The policy also calls for wider coverage of comprehensive sexuality education in schools. “We have created a management structure to take care of our young population,” said Alan Jara, the governor of Meta. Mr. Jara knows all too well the costs of violence – he was abducted and held for seven years by the Revolutionary Armed Forces of Colombia. For her part, Viviana says improved access to sexual and reproductive health information will help young people make better choices. “The state must invest in, and reach out to, young people with information so we do not have to make important decisions without knowing about our own bodies or about how to make our dreams and projects come true,” she said. Viviana, who will receive her law degree this year, says investing in young people is the key to ending violence and promoting peace. “I believe in a peace built by listening to young people, a peace that fulfils the needs of a population, which is the building block of society,” she said. Mr. Jara agrees: “Peace is built by facilitating viable opportunities for people´s dreams and expectations, especially those of young people." Watch a video (in Spanish) featuring Viviana here.